CWC Silchar Recruitment Application Form, Silchar CWC Application form, CWC Silchar Recruitment 2017, Central Water Commission Silchar Recruitment 2017, CWC Silchar Recruitment, CWC Skilled Work Assistant Recruitment Assam, CWC Silchar Skilled Worker Assistant Recruitment, CWC Silchar Driver Recruitment, CWC Gandhinagar SWA Recruitment 2017. IN BRIEF: Central Water Commission (CWC), Silchar Assam has recently invited applications for the 33 post of Skilled Work Assistant (SWA) and Driver. Candidates who’s age is not more than as specified in CWC jobs notification and having qualification of Matriculation / ITI from the Board/ Institute recognized by the Government of India with relevant experience (if any) are eligible to apply for the post. For Skilled Work Assistant (SWA) : Matriculation/ ITI or equivalent from recognized Board/University/ Institution. For Driver : Matriculation or equivalent from recognized Board/University/ Institution and possession of Valid motor Vehicle driving license. SELECTION PROCEDURE: Shortlisted Candidates will have to appear for Written Test and/or Interview. 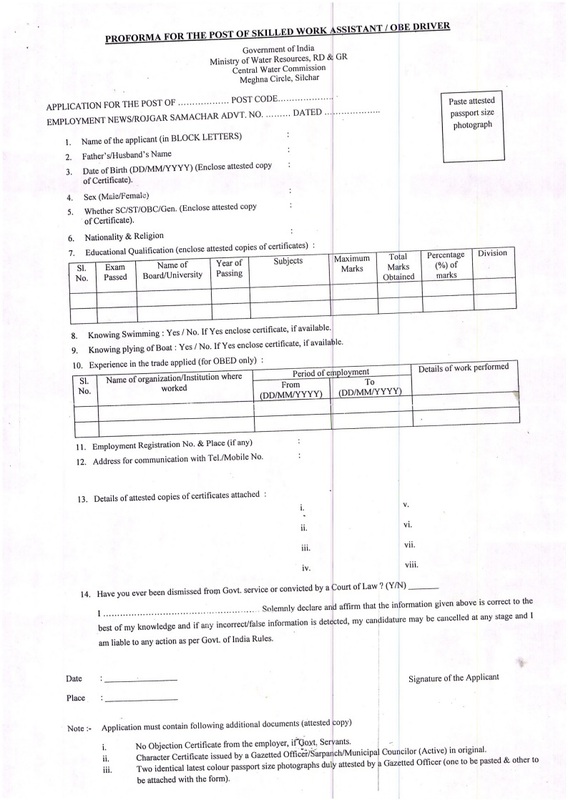 Interested candidates may apply download the prescribed application form by clicking this link and sent the form along with self attested copies of proof of date of birth, Matric / ITI or equivalent certificate, Community Certificate in respect of SC/ST/OBC issued by competent authority send by post only on or before within 30 days from the date of Publication this Advertisement. It is actually a nice and helpful piece of info. Please keep us up to date likee this.